Calvin Broyles: Bernard Nacht & Co. In 1906, Bernard Nacht started his business in Lower Manhattan on Maiden Lane buying and selling diamonds and jewelry to the trade. His formula for success continues today as a fourth generation business. 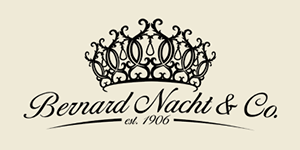 Bernard Nacht and Company continues to provide the jewelry trade with the best in diamonds, estate, antique and fine jewelry. Thank you to all of our loyal customers, both domestic and international, throughout the past 109 years. Visit Bernard Nacht & Co.